The Liverpool legend responded to the current Reds goalkeeper’s retort to fellow Sky Sports pundit Gary Neville. LORIS KARIUS IS taking stick from all sides recently, and he certainly felt the full force of Jamie Carragher’s ire as the Sky Sports pundit let rip during half-time of the game against West Ham United. Karius should have done better with Dimitri Payet’s free kick, which levelled the scores at Anfield, and the former Liverpool defender did not mince his words about the incident at the interval. The German shot stopper hit out during the week at Gary Neville’s criticism of his role in Liverpool’s collapse at Bournemouth, but Carragher said he should stick to doing his talking on the pitch. 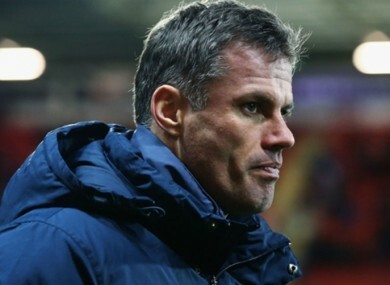 The ‘keeper got criticism last week and has come out and had a pop at Gary Neville and mentioned me and my advice would be: ‘Shut up and just do your job,’ Carragher said on Sky Sports at half-time. “And doing your job and answering your critics would be saving that (Payet’s free kick). That is not difficult, I think the positioning is fine, he gets across and reads it well and he is there. As news spread of Carragher’s outburst he quickly took to Twitter to ask reporters to pose the questions to Jurgen Klopp in the post-game interviews. Email “'Shut up and do your job!' - Carragher's advice for Karius”. Feedback on “'Shut up and do your job!' - Carragher's advice for Karius”.